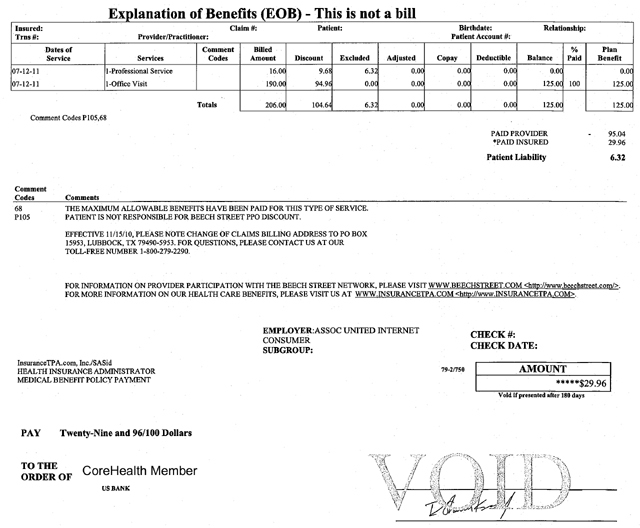 An EOB (Explanation of Benefits) is a report that reflects the costs and re-pricing for services/procedures performed by a Provider (Physician, Lab Facilities, Hospitals, etc. ).Â Although not a bill, an EOB is an important part of the insurance claims and benefit process.Â As long as your health claim is submitted to InsuranceTPA.com for timely processing, you can expect to receive your EOB by mail 15-30 days after medical services were rendered.Â You can view your claim status and EOB’s online by logging into your account here, InsuranceTPA login. Dates of Service will list out the dates for which the services were performed by the provider. Services will show a brief description of the service that was performed by the provider. Comment Codes reference notes or comments pertaining to individual services.Â These codes will correspond to specific notes below the EOB grid. Billed Amount shows the cost of each service as billed by the provider. Discount is the savings that were seen by using a provider in the PPO Network.Â In the example above, for the 2 services received the total charge was $206.Â Because this member used a Network Provider, they were able to save $104.64.Â Find a provider near you and start saving today – click here. Excluded are amounts not covered under the plan.Â As with any health insurance plan, limited medical indemnity plans also have limitations and exclusions to coverage.Â However, excluded services/procedures are still eligible for Network Savings.Â In the example above, the “Professional Service” charge of $16 was excluded under the CoreHealth plan, but still received Network Savings of $9.68.Â The final excluded amount remaining after the Network Savings was a mere $6.32. Adjusted is not commonly used.Â The “Adjusted” column would be used if a claim ever needed to be re-processed.Â Any additional payment resulting from the re-processing of the claim would be found under the “Adjusted” column. Copay plans are no longer being used by InsuranceTPA.com so this column will be empty. Deductible is the amount you must pay before your insurance reimbursement pays its portion for covered health expenses. Balance is the amount that remains after any Network Savings are applied, but before the Insurance Benefits are applied. % Paid shows the amount of the available Insurance Benefit that was paid out towards the remaining balance.Â In the example above, the Office Visit benefit was paid at 100%, or $125. Plan Benefit shows the available Insurance Benefit being applied to the total remaining obligation. Taking the time to review and understand your EOB will show you the real value your CoreHealth plan provides.Â If you have questions about anything seen on your EOB, please feel free to give us a call.Â We’re here to help in any way possible.Â With questions, call 800-279-2290 or email claims@insuranceTPA.com.